Foodie Travel Guide to Boston - where to stay and eat! Boston might just be my favorite city in the USA – and this Boston Foodie Travel Guide will tell you all the reasons why I love this East Coast city so much. Where to stay and what to eat, no matter the season! Boston, one of the oldest cities in the United States, packed with history at every turn, is my go-to city when someone’s looking for great food, amazing culture, and interesting things to do. Honestly, I describe it as a smaller, cleaner New York City, with just as good (if not better) restaurants. Everything from some of the best Chinese soup dumplings to classic New England lobster rolls, Boston isn’t anymore only known for sports but for the incredible works chefs are doing to elevate the cuisine of this East Coast city. But before we get into the food, let’s talk about where to stay, which is the number one question I get from friends and readers visiting. Below, I’m listing three of my favorite hotels in Boston – each one for a specific type of traveler. 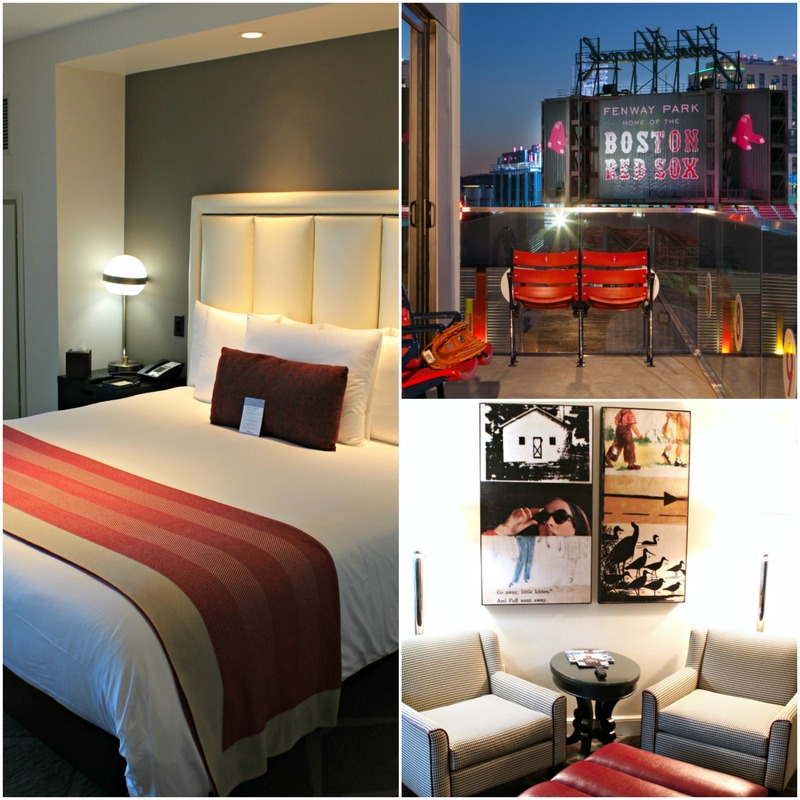 The Hotel Commonwealth is a sports fan dream come true, specifically if you’re a Red Sox fan! 96 stylish new rooms, brand new event space, and an outdoor terrace facing Fenway Park makes this hotel a favorite. The rooms are spacious and incredibly comfortable, with everything you might need during your travels. My room was facing Boston’s historic Kenmore Square and Commonwealth Avenue, which made for a great view to sip my morning coffee with. Another great perk is that connected to the hotel are two of Boston’s best restaurants: Eastern Standard and Island Creek Oyster Bar. Both superb spots, 100% recommended. On my bucket list? Once spring baseball starts, to book the Baseball Suite here for my Red Sox loving husband and I! They have five other signature suites that are worth checking out and I think are definitely worth the splurge. Hotel Commonwealth is located on 500 Commonwealth Avenue, Boston, MA. 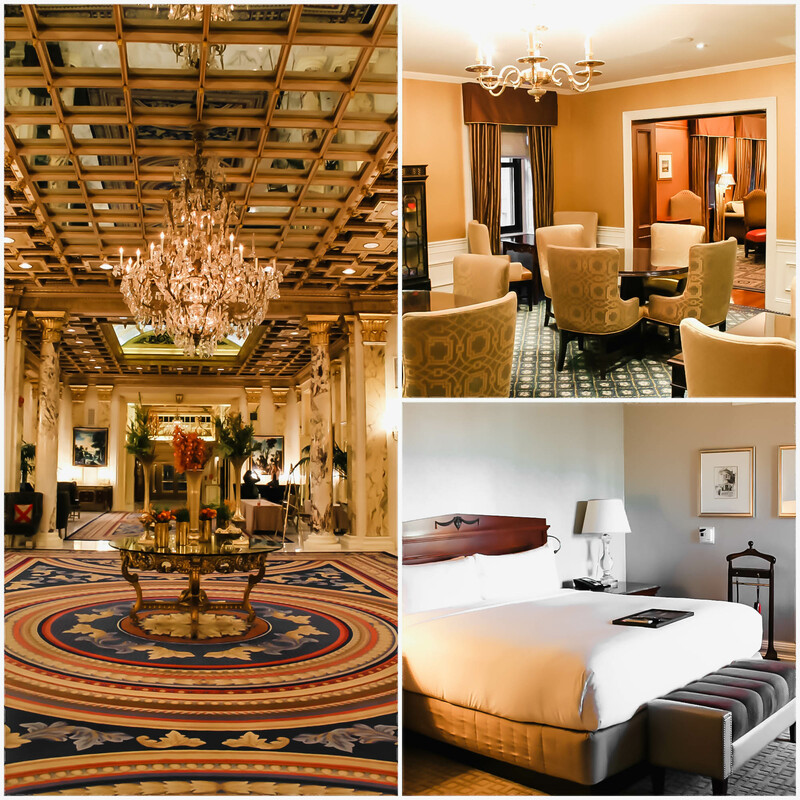 We recently stayed at the Fairmont Copley Plaza Hotel and it blew us away with its luxurious feel and furnishings. As soon as you walk in, you feel like royalty. It has been a symbol of Boston’s rich history and sophistication since 1912, but even though it’s more than one hundred years old, you can’t tell its age because of the modern renovations. Steps away from Newbury Street, where the shopping is great if you’re looking to treat yourself! The Fairmont Copley Plaza also enjoys having a hotel on property that is worth not even leaving the premises for – Oak Long Bar + Kitchen. We dined there not once but twice in the 24 hours we were at the hotel – both for lunch and dinner, although next time I visit I’ll make sure to wake up early for their breakfast which looks divine. The chefs at the restaurant are seriously putting out some incredible food, like this hearth roasted lobster with heirloom tomatoes, shishito, tarragon butter, and lemon. Perfectly cooked and so flavorful. For lunch, we tried their clam chowder, which I go into detail on my Instagram account here on why it was a delicious chowder and did not disappoint. A must whether you’re a guest of the hotel or not! The Fairmont Copley Plaza Hotel is located on 138 St. James Avenue, Boston, MA. If you’ve followed me on Instagram for some time now, you know I’ve worked with the Sheraton Boston a few times before and for good reason. Their attentions are always incredible, the location can’t be beat, and it’s always a pitstop before most trips we make. 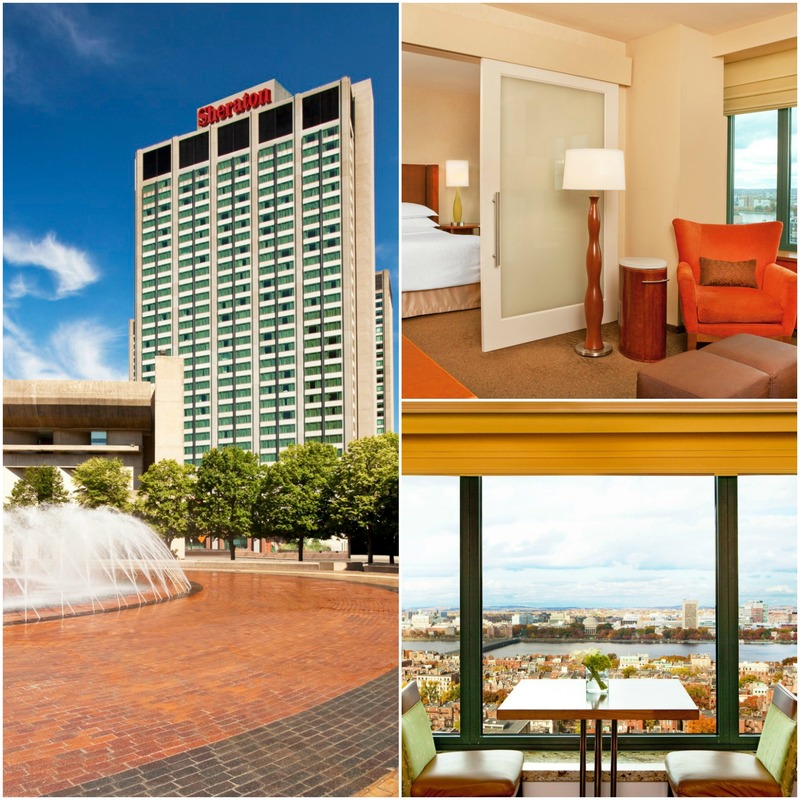 Being connected to the Prudential Center not only makes the Sheraton Boston a great hotel for business travelers, but for those of you that love to shop, it’s heaven! The Pru is also a foodie destination because it’s home to Eataly (read my Eataly Boston post here), as well as many other restaurants, shops, and more. On a side note, if you’re Catholic, the Prudential also has a little chapel which I’ve attended Mass at on Sundays if traveling! Food-wise, the Sheraton features a great hotel bar called Sidebar and a a bar menu called Paired – “Inspired Ingredients. Expertly Matched” is the tagline and it sure delivers. Read about my experience at Sidebar here. Overall, better than any hotel bar because the kitchen really puts attention to the blend of ingredients and isn’t just serving up mixed nuts. Oh and another reason why this location is great is because a Flour Bakery just opened across the street, so you can get your coffee and sticky buns first thing in the morning! Sheraton Boston Hotel is located on 39 Dalton Street, Boston, MA. Now that I’ve recommended my top three hotels in Boston, let’s talk about food! Like I mentioned, this city is packed to the brim with some incredible food, amazing restaurants, and creative chefs on every street corner, but like everything, I do have my favorites. The great thing about Boston is that you can find everything from fine dining to street eats, and still have an amazing meal – although I do recommend researching the places a little before sitting down for a meal. Best way to find great, local eats? Ask your Uber driver – no joke! I’ve been on many rides that have ended in my scrambling to take notes on my phone as the driver rambles off his favorite Dominican restaurant with the best empanadas (it’s in Dorchester!) or the best late night cocktails. It’s funny how Boston natives are stereotyped as “massholes” and granted, some are, but almost everyone is happy to share a good food tip if you ask! Some of the best produce comes from New England farmers and that’s why Boston has its fair share of markets all week long. 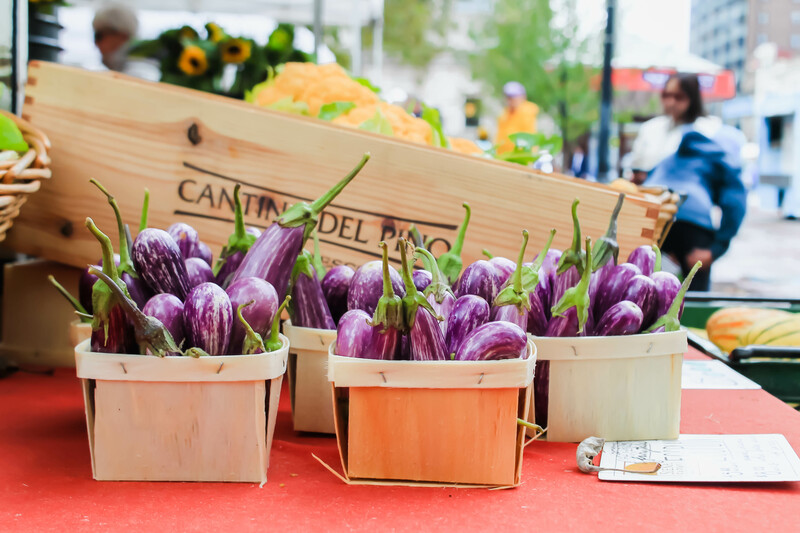 Some of my favorites include Copley Square Farmers Market (Tue & Fri 11am–6pm, May–November only), the SoWa Open Market (10am–4pm Sundays, May–October only), and Haymarket (Friday–Saturday 6am–7pm). In these, you’ll find gorgeous produce, artisan baked treats and breads, along with some of the best pies you’ve ever tasted, ethnic foods like delicious Indian, and more. Remember to bring your reusable bag and shop hungry! Parish Cafe is one of my favorite places for lunch in Boston. We’ve been there a variety of times and one of my latest favorites was when we both decided to go vegetarian and other both the Eggplant Milanesa and The Alden (pictured below). The Milanesa is so delicious, created by Chef Jamie Bissonnette of Toro and Coppa, and it’s thinly fried eggplant on a sesame torta roll, slathered with black bean spread, chipotle aioli, avocado, and Oaxaca Mexican cheese. it’s served with some of the best Chipotle slaw – I’d go back just for the slaw, it’s that good! The Alden, created by Michael Scelfo, chef/owner of Alden and Harlow in Cambridge. It’s charred broccoli on ciabatta with pecorino aioli, crispy chickpeas, sliced hot cherry peppers, and fresh basil leaves. So filling, so unique – a winner as well! Parish Cafe and Bar has two locations, one on Boylston Street and the other in the South End. As mentioned above, Oak Long Bar + Kitchen is the restaurant located at the Fairmont Copley Plaza Hotel, but don’t consider it a “hotel restaurant” as it stands alone in all its glory, for great food awaits. I recommend this spot for both lunch or dinner, as we tried both in the span of 24 hours. For lunch, sit at the bar and chat it up with one of the friendly bartenders and order a flatbread, some clam chowder, and their avocado crab toast. Three favorites we can’t go back to taste! For dinner, settle into one of the tables tucked away in the back and peruse the menu for some delights. You can see the wood-fired hearth oven and a few chefs making the hearth cooked items. It’s like dinner and a show, all in one. 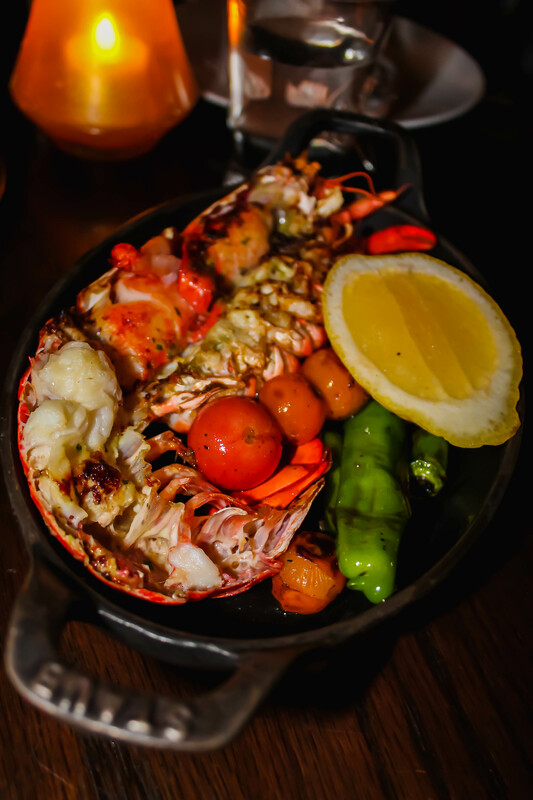 For dinner, the hearth roasted lobster pictured below was a favorite, as well as their scallops, cauliflower, and any other vegetable side dish. It was a pleasure to see chefs putting so much effort into vegetable dishes – the world needs more delicious plant-based meals! Oak Long Bar + Kitchen is located on 138 St. James Avenue, Boston, MA. This fall we had the pleasure of visiting State Street Provisions, which came very well recommended by a few of our Boston-loving friends. As soon as you walk into State Street Provisions, you feel at home. It’s a welcoming restaurant that recreates the feel of an old-time tavern but with modern and forward-flavored menu items. Offering both lunch, dinner, and brunch, we were there for dinner one night and boy was it incredible. I visited with a good friend and as we settled into our table, we knew we were in for a treat. The service was impeccable, our waitress attentive and knowledgeable about the menu. Their Tuna Crudo, with green chili infused olive oil, crispy shallots, and lime. A unique flavor combination, we loved the texture the crispy shallows added to the dish. Pictured below was one of the most unique dishes I’ve ever had: their Octopus Mortadella. 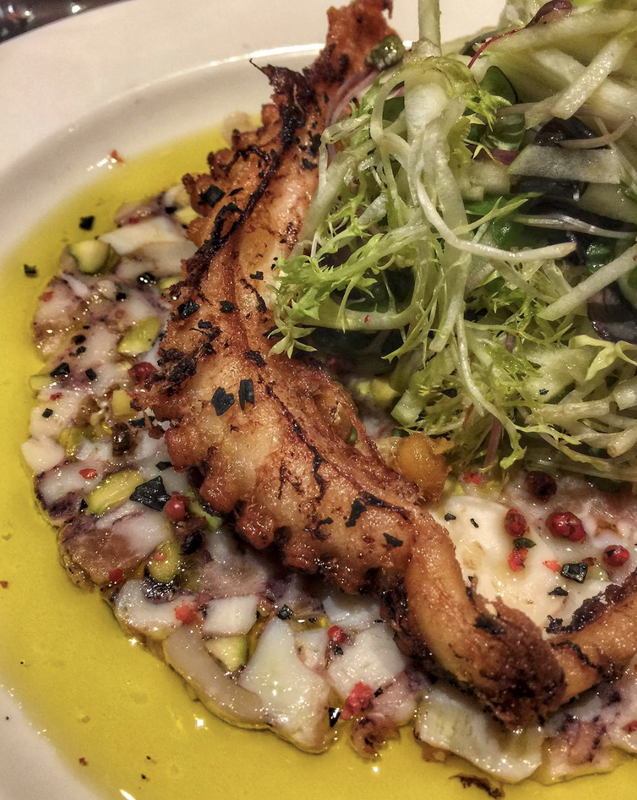 They painstakingly create this loaf of octopus, pistachios, and more, thinly slice and serve drizzled with incredible olive oil, crispy octopus testable, and a salad of fried chickpeas, apples, and mint – a must have! Other things we tasted that we would go back for: Sriracha-Miso Deviled Eggs, Grilled Atlantic Salmon, and any of their desserts for sure. State Street Provisions is located on 255 State Street, Boston, MA. You can’t talk about Boston and not mention the great Asian population that resides in the city. 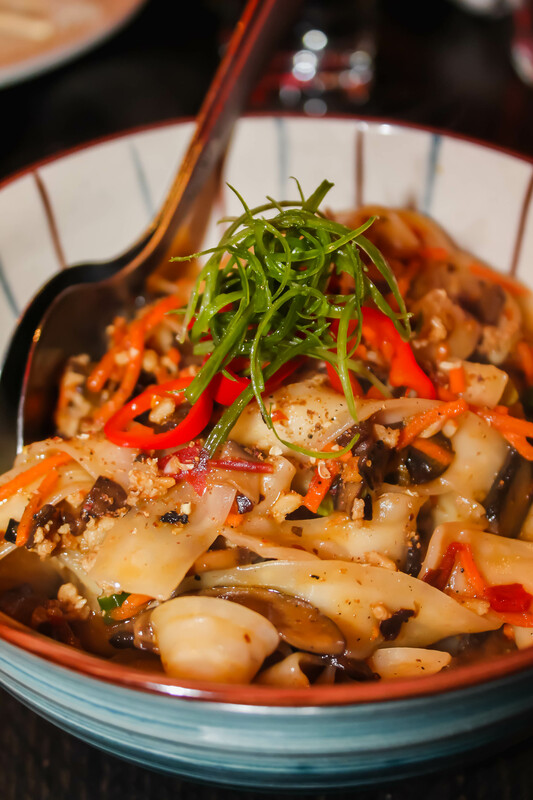 With a busy Chinatown, a favorite of many celery chefs, the dumplings and dishes you find there are authentic, flavorful, and just what you crave when craving Asian food. A new favorite is called BLR by Shojo, or “Best Little Restaurant”. The Best Little Restaurant was established in the early 1980s and has been in the Moy family for over 30 years. With the new generation of the Boy Family, they are still focusing on incredible flavorful dishes sourced from local producers. This spot is only open for dinner and it’s the place to stop in after a show. I wish I could narrow down my favorites but everything we ordered was SO GOOD, I can’t choose. Below you see pictured their Szechuan Bolognese: Handmade Ribbon Noodles, Szechuan Peppercorn, Mushrooms, Ground Pork – basically the best noodle dish in Boston! If you love big flavors and incredible spices, this is the place. Order the Shrimp Summer Salad as an appetizer – packed with ripe mango, papaya, lime and mint, it’s a refreshing item to have on the table to take bites between anything too spicy. The Roasted Bone Marrow is an uncommon dish in a Chinese restaurant, but this one is served with scallion pancakes you slather the marrow on, topped with seafood XO sauce, charred Brussels sprouts, and a sweet soy glaze. Unlike anything else I’ve tasted and I can’t wait to go back. Now, let’s talk sweets in Boston. So many options and I’ll be focusing on two ethnic treats: Loukoumades from Greece and Cannoli from Italy. There’s so much more as well – Boston has some of the best hot chocolate, ice cream, doughnuts, cakes, and so much more – so explore the dessert menus, the online recommendations, and just follow your nose – sometimes the tastiest, sweetest thing is a corner away! 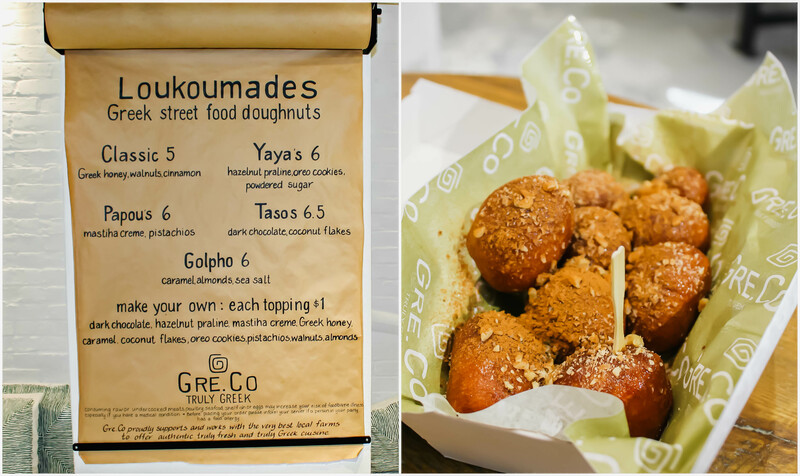 Greek street food doughnuts called Loukoumades are warm and delicious. If it’s your first time at Gre.Co, order the Classic ones and enjoy a trip to Greece for just $5! Fried to order and drizzled with Greek honey, crushed walnuts, and cinnamon, these are perfect after a brisk walk around the city. Since it’s located on Newbury Street, start your day with a coffee and a few doughnuts and you’ll have sweet energy to burn while you shop! Gre.Co is located on 225 Newbury Street, Boston, MA. You can’t go to Boston without having a cannoli – and for that, you need to head to the North End, also known as Boston’s Little Italy! It’s home to a dozen cannoli bakeries and a few months ago I decided to try the top three, for a taste test on what the best cannoli in Boston is – Maria’s Pastry Shop was hands down the winner and you can read more about how we came to that by reading my “Discovering the Best Cannoli in Boston” post. Maria’s Pastry Shop is located on 46 Cross Street, The North End, Boston, MA. Hoping this travel guide to Boston has to putting together a trip to this city as soon as possible – it’s a great city to visit in all seasons, packed with incredible restaurants, bars, hotels, and activities to do. Leave a comment below if you’ve ever been to Boston and what you love most about! This is such a great guide!! I love Parish and the Oak Bar <3 And agree that Boston is the best!